Eating disorders specialist and psychologist Dr. Susan Albers is the author of the Eating Mindfully Diet. Albers’ goal in writing the book was to provide simple techniques for dieters who have struggled with chronic dieting, difficulty controlling their weight and psychological stress related to mindless eating. By using Buddhist concepts and cognitive behavioral techniques, dieters discover how to identify the reasons why they engage in mindless eating. This is generally related to either obsessing over or ignoring the messages coming from the body. The goal of the plan is to learn to listen to your body and to make healthy food choices by being mindful. This will enable you to nourish yourself appropriately while developing a healthy body image and a positive emotional outlook. The plan is focused mainly on enhancing awareness of food choices and eating behaviors and does not go into detail about what specific foods should be eaten. Dieters are classified into one of four categories of mindless eaters and throughout the book practical exercises are provided to enable an increase in the experience of eating mindfully. Although the plan is not detailed regarding dietary recommendations, Albers does provide some general guidelines to enable dieters to get in touch with their true instincts regarding food and eating behaviors. Eat at least three meals a day including breakfast. Have something small to eat every three hours. Avoid using caffeine as a source of energy. When you feel very hungry eat warm food because it is more filling. Avoid snack foods and appetizers, as it is much easier to over-eat these foods. By following these guidelines dieters will be less likely to experience blood sugar fluctuations that can be a potential trigger of food cravings and emotional instability. Dieters are encouraged to tune into themselves before and after eating and learn to become conscious of the reasons for wanting to eat, whether it is true hunger for food or eating for other reasons such as stress or depression. Albers explains that when self-awareness is increased dieters can understand their eating behaviors more deeply and a healthy relationship with food will result. Dieters will ultimately learn to eat in a way that provides adequate nourishment without being overfed. No specific foods are recommended or to be avoided on this plan as the focus is on controlling food intake by increasing self-awareness. Look here for many healthy meal ideas. Dieters are encouraged to stay physically active but are reminded to be careful not to obsess about exercise or to avoid it. The advice given is to listen to your body and commit to an amount of exercise that is appropriate for you at this stage in your life. These exercises can be used with the Eating Mindfully Diet. 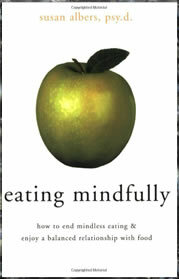 The Eating Mindfully Diet retails at $15.95. Promotes a positive body image and provides alleviation from the dieting mentality. Addresses the importance of emotional balance and awareness for a healthy diet and long-term weight loss. Good for yo-yo dieters as it may provide the tools necessary to break the cycle of dieting and binging. Provides tips for how to deal with holidays and eating out. Dieters do not have to avoid their favorite foods so long as they practice mindful eating. Lacking in guidance about what to eat. Not really of relevance for dieters who do not regard themselves as emotional eaters. Not all individuals will relate to the Buddhist approach that is outlined in the book. Will probably take some time for dieters to experience noticeable results. The Eating Mindfully Diet is most appropriate for dieters with issues related to food or body image including all types of eating disorders. However if you are looking for a precise diet plan this book will not suit your needs as no recommendations are given about what to eat. If a commitment is made to follow the principles outlined in the plan dieters are likely to achieve their ideal weight as they learn to tune into true hunger, begin to make healthier choices and reduce binge eating. This diet is very good, as it allows you to understand the purpose of eating food. ” Eat to live, don’t live to eat” I have tried this approach, it’s important to be calm and think with an open mind when approaching food. Listen to what your body wants, and you’ll see change will come by itself.